"This card has not yet been used in a deck." Really tells you about the power level of this card. Finally BGH is nerfed, and then GvG expires from Standard. Not easy to be a golem. See the thing is, at it's best it's a vanilla 6 mana 9/9. If there was a vanilla 6 mana 9/9, it might not even see play in constructed because it gets BGHed and you're left with nothing. Cards which are vulnerable to BGH *must* be able to leave you with SOMETHING or they're just not good. Grommash gets one attack off, Ragnaros hits something for 8, Dr. Balanced gives you Boom Bots. This thing gives you jack squat for your 6 mana. I think you're oversimplifying drastically when you say that big minions "*must* be able to leave you with SOMETHING." Yes, Anima Golem into BGH is bad, but Ragnaros into 8 damage to pop Argent Squire's shield into BGH is pretty much just as bad. It's happened to all of us. Sylvanas, while not being a BGH target, often ends up as a "6 mana 5/5, Battlecry: force an inefficient trade," and sometimes ends up as a straight 6 mana 5/5. That doesn't mean we don't run those cards. The question for Rag is the same as the question for Anima Golem: is the risk of an immediate BGH worth it? And that depends. 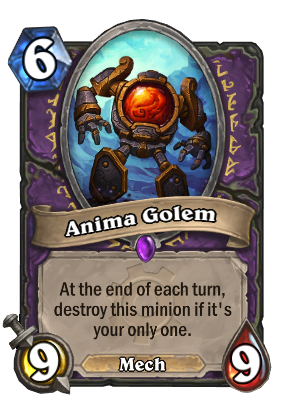 If Blizz comes out with a Mini-Anima Golem 4 mana 7/7 and a Medium-Anima Golem 5 mana 8/8, then the answer will be an obvious yes because you can only put so many BGHs into a deck. I'm not saying Anima Golem is playable right now, just that you're being a bit too dismissive. Currently using this in a midrange lock using shade of nax to keep it on the field. 6-0, will keep testing (2-0 vs handlock, 3-0 vs zoolock, 1-0 vs ramp druid). If I can get this to rank 7-5 then I'll post deck on here sometime. Tried it in a Demonlock Deck wich Void Terror with some success, eliminates the drawback. Anime Golem! I've gotten this from playing Recombobulator on my Argent Commander. Opponent conceded on the spot. This card could go really well in a deathrattle deck. if you have a Harvest Golem, for example, the enemy would have to kill that thing both times in order to kill this guy. Same goes to Nerubian Egg.